Under pressure, short fat Arborio rice kernels transform into delectably creamy risotto–in just 4 minutes. By adding green chiles, spicy pepper cheese, and pumpkin seeds, the Italian rice dish takes a Southwestern turn—into spicy Instant Pot chard and pinto bean risotto. This recipe first appeared on Pressure Cooking Today where I’m a contributor. Quick and infinitely adaptable by changing out ingredients and seasonings, risotto is one of my favorite dishes to make in an Instant Pot or pressure cooker. I’ve read that modern Italian cooks often prepare their risotto in a pressure cooker. It makes sense: My trusty old stovetop pressure cooker is Italian-made, and, world-wide, for one reason or another, many busy families have two working adults. If home-cooked healthy food is important, so are timesavers like pressure cookers. Risotto is a culinary canvas—paint it however you like. 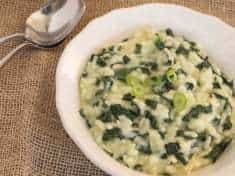 Start with this spicy Instant Pot chard and pinto bean risotto recipe, then sub in different greens or beans, like I did in these risotto recipes featuring bok choy, spinach, or kale. You might stir in another variety of cheese, goat cheese, for example. Parmesan, the traditional risotto cheese, is always a good choice. 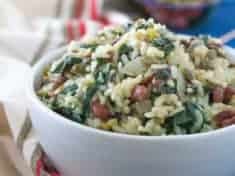 Click here to PIN Spicy Instant Pot Chard and Pinto Bean Risotto! Finished risotto should be creamy, but not soupy. To get there, I cook the rice under pressure with not all of the vegetable broth, and then, after a quick release of pressure, stir the remaining broth along with the beans and greens. 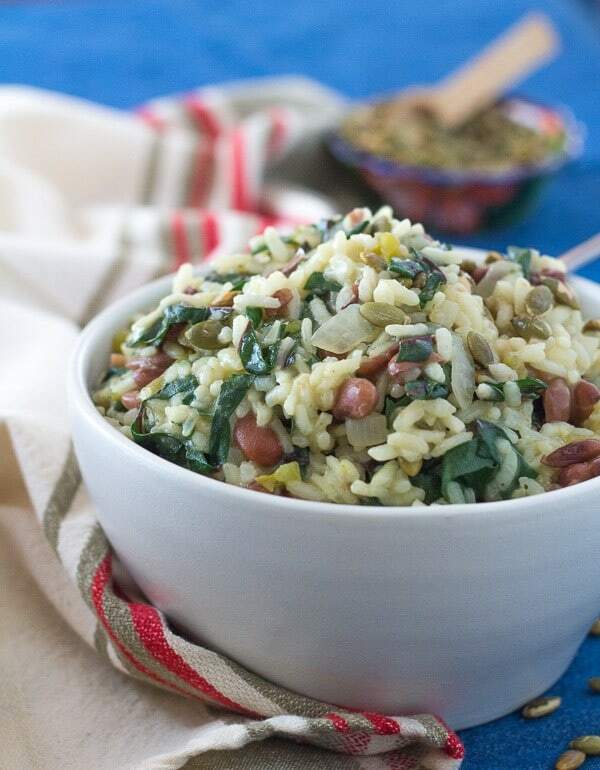 While the beans heat through and the greens wilt, the starchy rice makes its own creamy sauce. It’s really not that hard to make risotto the traditional method–it just takes more time at the stove. Instead of stirring in broth ½ cup at a time, with a pressure cooker you add the liquid all at once, close the lid, and set the timer. Truth is, I’m lazy. It takes about 5 minutes for the cooker to come to pressure, and a minute for the pressure to quick release at the end, and instead of stirring risotto, I use the time to prep the chard and grate the cheese. **Make risotto vegan by leaving out the cheese. Always taste your risotto, and if it needs a flavor bump, stir in a teaspoon of cider vinegar or lemon juice, especially if you skipped the cheese. Toasted pumpkin seeds add crunch and nutritious protein. 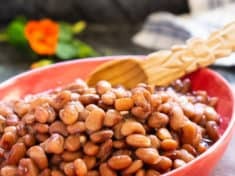 Here’s how to cook pinto beans from scratch–in 15 minutes in the pressure cooker! Last year sales of the electric Instant Pot pressure cooker went viral. If you are one of us newbies, may this vegetarian creamy greens and beans risotto lure you into the kitchen to play with your new toy. If you don’t even own a pressure cooker, I hope this recipe inspires you just the same! You’ll need more veggie broth—about 5 to 5 ½ cups. Keep it in a separate pot, on a very low simmer. Sauté the aromatics in a saucepan with the oil, then add the rice, stirring until coated with oil and slightly translucent, just as you would when pressure cooking. Add the broth, ½ cup at a time, stirring constantly, adding more when each addition is just about absorbed. Repeat until the rice is almost tender, 20-35 minutes. Stir in the pintos, green chiles, and chard. Continue to cook, adding more broth, ¼ cup at a time, until the chard wilts and the rice is tender but still firm, and bound with a creamy sauce. Just before serving, stir in the cheese. Skip the pepper Jack cheese and add the red pepper flakes. Make it a fabulous week–get in the kitchen and cook something delicious! If you have a pressure cooker–bring it out and make risotto easy! PS If you make this recipe, please consider leaving a blog post comment. Your comments help other readers learn more about the recipe. 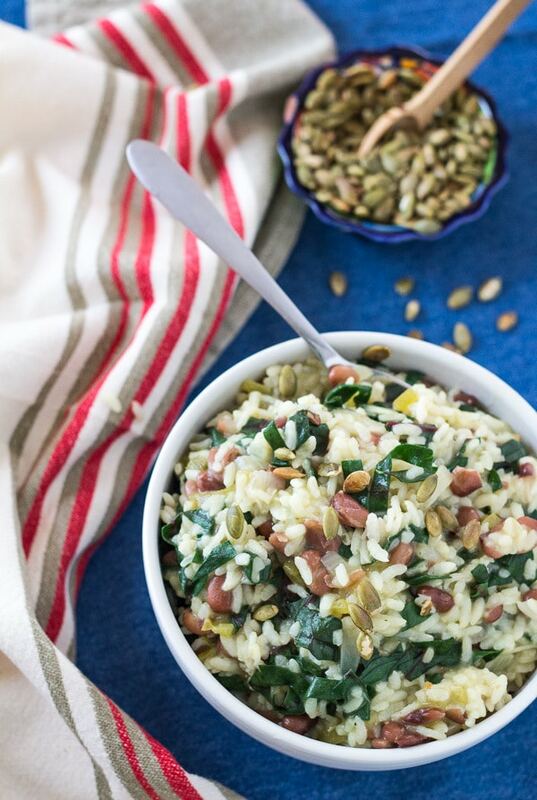 Chard, pinto beans, green chiles, pepper cheese, and pumpkin seeds bring a Southwestern twist to risotto, the creamy Italian rice dish. Made easy with an Instant Pot or stovetop pressure cooker. Serves about 6 people, 1/2 cup each. Pepper jack cheese is not included in Nutrition estimate. Add 35 calories and make it 2.3 more grams protein per serving if you add the cheese. Heat the oil in the Instant Pot or pressure cooker. Sauté the onions and garlic about 5 minutes, until the onions are translucent. Add the rice and continue to stir to coat the grains. Stir in 3 ½ cups of the vegetable broth. Lock the lid in place. Bring to high pressure and cook for four minutes. Remove from heat and release the pressure immediately, following the directions for your pressure cooker. For Instant Pots, turn the top dial to Vent. For Instant Pots: Press saute. With stovetop pressure cooker, return to the heat. Stir in the pinto beans, green chiles, chard ribbons, and the remaining ½ cup of vegetable broth. 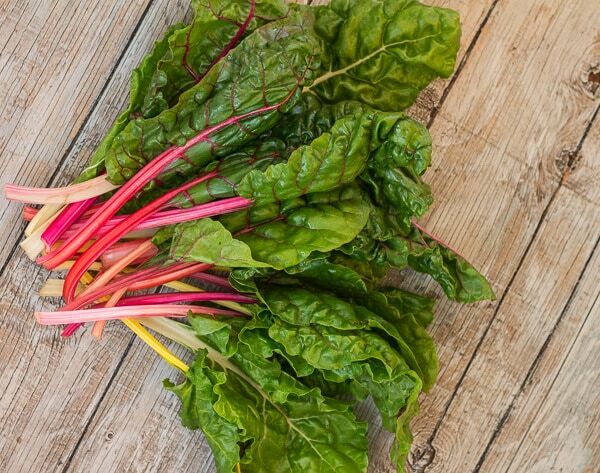 Cook, stirring constantly until the chard has wilted and the beans are heated through. The risotto should be creamy yet still al dente, with a bite to your tongue. Stir in the cheese, if using, or red pepper flakes. Taste and add salt if you think it’s needed. If you like more spice, add another pinch of red pepper flakes. Garnish with toasted pumpkin seeds. No pressure cooker: You will need more veggie broth—about 5 to 5 ½ cups. (Keep the broth in a separate pot on a very low simmer.) Sauté the onions and garlic in a saucepan with the oil, then add the rice, stirring until coated with oil and slightly translucent, just as you would when pressure cooking. Begin adding the broth ½ cup at a time, stirring constantly, adding more when each addition is just about absorbed. Repeat until the rice is almost tender, 20-35 minutes. Stir in the pintos, green chiles, and chard. Continue to cook, adding more broth, ¼ cup at a time, until the chard wilts and the rice is tender but still firm, and bound with a creamy sauce. Finish with the cheese, and pumpkin seed garnish, as for pressure cooker. How to use the pressure cooker to cook beets in 15 minutes. Simple directions.